A Bûche de Noël, interpreted by Caitlin Dysart, Pastry Chef of 2941. By Caitlin Dysart, Pastry Chef of 2941. Photography by Reema Desai. From The Last Bite in our Winter Holiday Issue 2015. 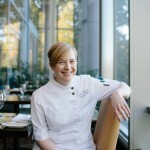 A native of Springfield, VA, Caitlin Dysart is the award-winning Pastry Chef at reknowned French restaurant, 2941. Dysart won the RAMMY Award for Pastry Chef of the Year in 2014. The holiday season can be rough when you work in the restaurant industry, but my child-like love for all things Christmas really helps me get through it. I get excited for the music, the decorations, the family traditions and—most importantly—the baking. As a pastry chef, I have to plan ahead for the holidays, I’m drafting menus and sketching desserts as soon as Labor Day hits. One of my favorite holiday desserts is the classic Bûche de Noël, or Yule Log Cake. We serve this traditional French treat for Christmas Eve every year at 2941. It’s a simple roulade made of sponge cake rolled with cream and covered in icing and it’s made to resemble a literal version of a yule log. The real joy of making a bûche de noël is in the decorating. Variations range from the traditional and rustic to sleek and modern. Every year the great patisseries of France release their version of the bûche and I’m always taken aback by their stunning and playful takes on the classic. I decided here to really exaggerate my favorite feature of a traditional bûche de noël: the meringue mushrooms! These little crunchy cookies take me back to my childhood, when my mother would make them for our annual Christmas party. They’re fairly easy to make, add a great texture to the dessert and, when clustered together in various sizes and colors, create a really stunning look that’s sure to wow your holiday guests. Feel free to experiment with different decorations: You can use marzipan to make holly leaves, coconut to mimic snow, or chocolate shavings to create a bark texture. I have selected a simple flavor profile for this cake, with a cocoa sponge, whipped crème fraîche and dark chocolate frosting. I also incorporated some marmalade to add a tart counterpoint to the rich chocolate. Just as with the decorations, add your own twist to the flavors with different spices or fillings. The possibilities are really endless, so once you’ve mastered the technique, you can look forward to create a new bûche de noël each holiday season. Preheat oven to 350°. Line a 16- by 12-inch baking sheet with parchment paper. In a medium bowl, combine the yolks with ⅓ of the sugar. Whisk until the yolks are pale yellow. Prepare a meringue with the egg whites and remaining sugar: In the bowl of a standing mixer, whip the egg whites on medium speed until foamy. Gradually add the sugar and whip, on high speed, until the meringue is stiff and shiny. Sift together the flour, cocoa powder and salt. Add half of the flour mixture to the whipped egg yolks and fold gently to combine. Fold half of the meringue into the batter. Fold in the remaining dry ingredients, followed by the rest of the meringue. Spread the cake batter evenly in the prepared baking sheet. Bake for approximately 5–7 minutes. The cake will be just dry in the center. Stir the cocoa powder into the warm water to dissolve. With an electric or standing mixer, beat the butter with the confectioner’s sugar and salt until light and fluffy, about 3 minutes. Beat in the melted chocolate, followed by the cocoa mixture. If preparing the frosting ahead of time, store in the refrigerator until needed. When you are ready to use it, bring the frosting to room temperature and beat until smooth. If crème fraîche is not available or you desire another flavor, substitute in equal parts with yogurt, sour cream, ricotta or mascarpone. Either by hand or using a standing mixer, whisk together all ingredients until stiff peaks form. Keep cool. The meringues can be prepared up to 2 days in advance; store in an airtight container. Preheat oven to 200°. Line 2 baking sheets with parchment paper. Sift together the confectioner’s sugar and cornstarch. In the bowl of a standing mixer, begin whisking the egg whites on medium speed. Once the egg whites are foaming, gradually add the sugar. Whip on high speed until the meringue forms stiff peaks. Gently fold the cornstarch mixture into the meringue. On the other baking sheet, pipe the mushroom caps: pipe mounds of meringue ¼ inch thick in various diameters, from ½ to 1 inch wide. If you would like to create red caps, as pictured, set aside ⅓ of the meringue and color with powdered food coloring. Place the piped meringues into the oven and bake until dry, approximately 2 hours. To assemble the mushrooms, “drill” a hole into the bottom of each cap using the tip of a small paring knife. Dip the tip of a stem into melted chocolate and insert into the hole in the cap. Place on a plate and allow the chocolate to set before placing on the bûche. Unroll the cake. Spread an even layer (about ¼ inch thick) of the whipped crème fraîche over the cake. Along the long edge of the cake, spread a line of marmalade or jam. Carefully re-roll the cake, pushing it away from you, using the parchment paper underneath the cake to facilitate rolling the cake and filling into a roulade. Trim the ends of the roulade to create clean edges. Spread the chocolate icing evenly over the cake, creating a rustic texture. If preparing the bûche ahead of time, store in the refrigerator. When you are ready to serve the bûche, remove from the refrigerator and place the meringue mushrooms on top. By Jai Williams, Special to EdibleDC When Chefs Christophe and Michelle Poteaux decided to move Bastille from its Old Town Alexandria location to the Parker Gray neighborhood, many may have thought “Why?” Yet the pair knew exactly what they were doing as their new community has embraced them with open arms and their bistro expansion continues. Situated on the corner of Pendleton and N. Fayette Streets, the restaurant boasts large, striking windows with generous patio seating indicative to the upcoming warmer months. Aesthetics aside, it is the Poteaux’s passion and commitment to executing delicious seasonal French cuisine that makes this restaurant a neighborhood gem. A delicacy in their own right, the frog “wings” had a crisp exterior as each piece was broken down individually making it easy to eat with a knife and fork. Accompanied by a Roquefort dip and Espelette sauce, when eaten together the subtle heat and smokiness provided a well-rounded flavor profile to complement the frog. 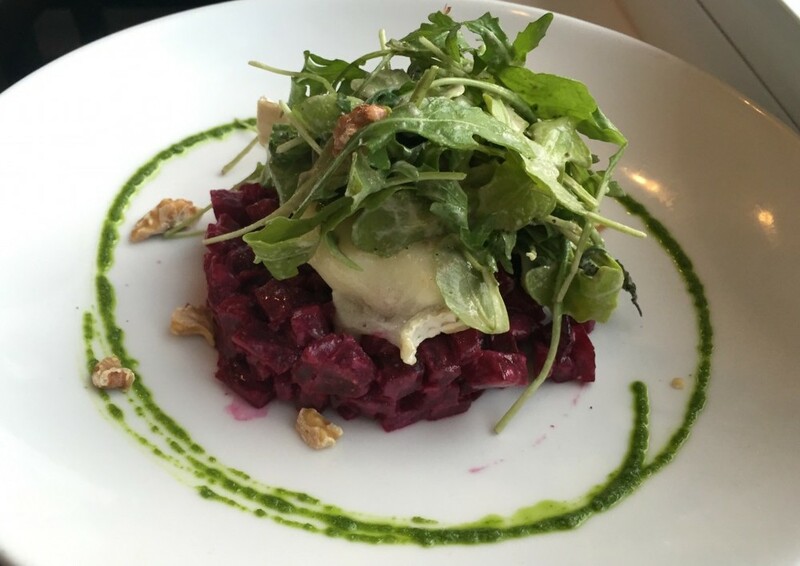 When our selected appetizer arrived, the colorful plate of dark red Tuscarora beets, bright green arugula caught our eye immediately. However, the creaminess of a goat cheese tartine juxtaposed perfectly with the crunchy walnuts. The visual stimulation continued as the main course arrived in its pastel glory. Vibrant, fleshy pink salmon from Skuna Bay (BC) sat atop a tender bed of leek fondue, drizzled in an aromatic dill lemon sauce, and finished with a side of grilled asparagus. And just when we couldn’t possibly eat any more, we remembered that we had a 2015 RAMMY nominated Pastry Chef in our presence and couldn’t pass on the opportunity. The Pamplemousse dessert brought together the beautiful complexities of spring. Gently burnt grapefruit, slightly sweet Ricotta, softened black peppered meringue peaks finished with a velvety olive oil ice cream had us questioning how something so good could be gluten-free; but it is, and there were absolutely no complaints on our end. Sommelier Michael Williams paired each course effortlessly as the servers were impeccable in their attention to detail. Not at all stuffy, nor unapproachable it’s evident why Bastille has continued to capture the hearts of Alexandrians and beyond for the last nine years and hopefully many, many more. Heat milk. Mix together egg yolks, stabilizer and sugar. Temper into hot milk. Cook mixture until the temperature reaches 165 degrees F. Remove the mixture from heat and ½ oz salt and the olive oil. Chill 24 hours. Strain the next day before processing in ice cream maker. Pour 2 quarts into ice cream maker and set timer, turn on blade and chill button. DO NOT OVER PROCESS!! Immediately remove ice cream from your maker and place a freezer safe container and seal with a tight fitting lid. Place the container in the freezer. This ice cream can get hard once in the freezer. To soften leave to sit out and temper on your counter top for 15 minutes or so (depending on how warm your house is) and scoop when ready. Mix the cream cheese, sugar, cornstarch and salt and blend well, stopping the machine occasionally and scraping down the sides of the work bowl. Add the ricotta and mix until smooth. Add the eggs and pulse just until blended. Pour the batter into 8” springform pan that has been wrapped to prevent water leakage, sprayed with pan spray and sugar coated. Place the springform pan on a jelly roll pan and place that in the oven. Pour enough water into the pan to come halfway up the sides of the springform pan. Bake until the cheesecake is golden and the center of the cake moves slightly when the pan is gently shaken. Refrigerate until the cheesecake is very cold. Unmold onto a cake plate or a cake stand. Line a deep tray with baking paper and the oven down to 100C/212F. Add egg whites to clean bowl of a Kitchen Aid with 1/4 tsp of cream of tartar. At first whisk slowly allowing small stabilizing bubbles to form, then increase the speed until the egg whites form medium peaks. Using a large spoon, add the sugar spoon by spoon while continuing to whisk. It is ready once you have a full bodied, stiff and glossy mixture (about 5 minutes). Stir in the black pepper. Fill the piping bag ensuring there are no air bubbles. Pipe small kisses onto a lined baking tray. Bake for 1 hour, then just turn the oven off and leave the meringues in there until the oven has cooled completely. Combine sugar, corn syrup and water and cook until the sugar turns a deep amber color. Remove from the heat. Add the juice from the segments and stir until smooth. Add the grapefruit segments and salt and stir gently. Syrup can be strained and used in your favorite grapefruit cocktail. Bastille Restaurant is located at 606 N Fayette St, Alexandria, VA 22314 neat Braddock Road Metro station - (703) 519-3776.